As you know, we said goodbye to our beloved Clyde a few days ago. I wanted you to have photos for the blog. Here are a few fun shots of Clyde, many of which you probably have already. He had the best of dispositions. He was always so patient and accepting of whatever he was handed, truly a trooper. He had a great and wonderfully full life and brought us so much joy and laughter. Clyde was instrumental in the rearing of several other neighborhood pets too. Many Thanks for this Opportunity! Thank you and Cliff for all your diligence in placing him so appropriately with us as our loyal pet. Luke has been a bit quiet this week but can easily be stirred up by one of us playing Clyde’s role. We have many fond memories, and the vet returned to us his Neuticles! Now that is service! Peace and love, Cal, Clyde and Luke (our Blue OwyheeStar Boy). We value our relationship with this family. It spans more than a decade and will go into the future. We have shared something special. Our hearts are saddened by Clyde’s departure; however, we know one day we will see him again. We thank you for all you have done for and with Clyde and look forward to hearing how things unfold with Luke. 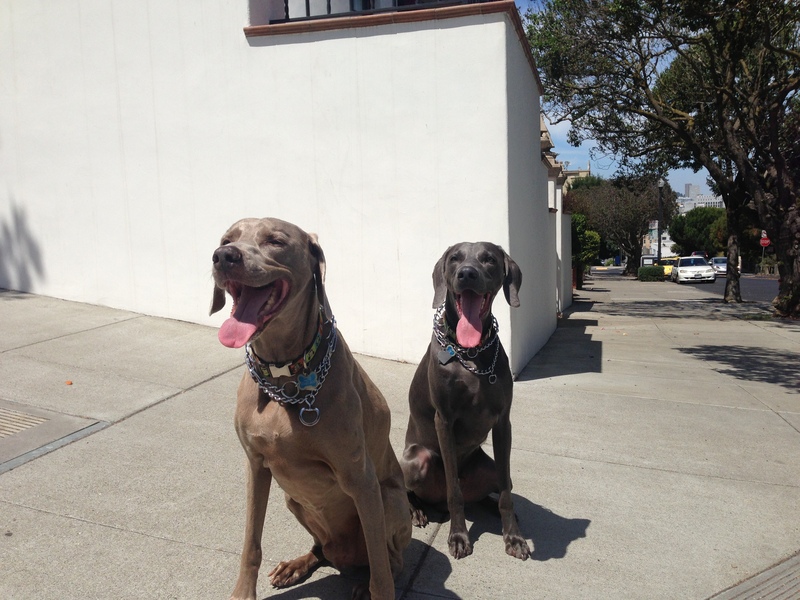 We are so happy you have Luke to continue the paw-print OwyheeStar Weimaraner Story. I read wrapped in a couple of your daily posts that you are challenged with overcoming breast cancer. Our prayers go out for you I am sorry it took me so long to get to writing but you are in our thoughts. Last summer I rode 550 miles from SF to LA on my bike in the Aids Life Cycle. I raised 15,000, the group on whole raised 15 M. I know there are a lot of benefits for breast cancer, I will keep my eyes open for one here and contribute with you in mind. Thanks again for all the wonderful memories you have helped us build with our beautiful family above. Breeder’s Note: Many people wonder why we would do this–the reasons they ask are varied. Some people think no one should raise puppies. Some folks believe we are crazy to put the passion, as well as the effort into doing what we do. Regardless, we meet people who share our love of the breed–they come from all walks of life-our relationship span decades. There are ups-and-downs; saying good-bye is not easy. Our lives are knit-together in ways we never would have thought possible. You look at the wonderful creatures you adore, and you remember us. Thank you for that! Thank you for all the updates, and the warm thoughts. They are greatly appreciated! For those who would like to read more about Clyde, and Luke, here are some previous blog posts. Luke turns 2 – here’s a few shots of the boys! Clyde has miraculously sprung back from his back injury in November. We are so happy he is himself again and are trying to get him to slow down a bit. 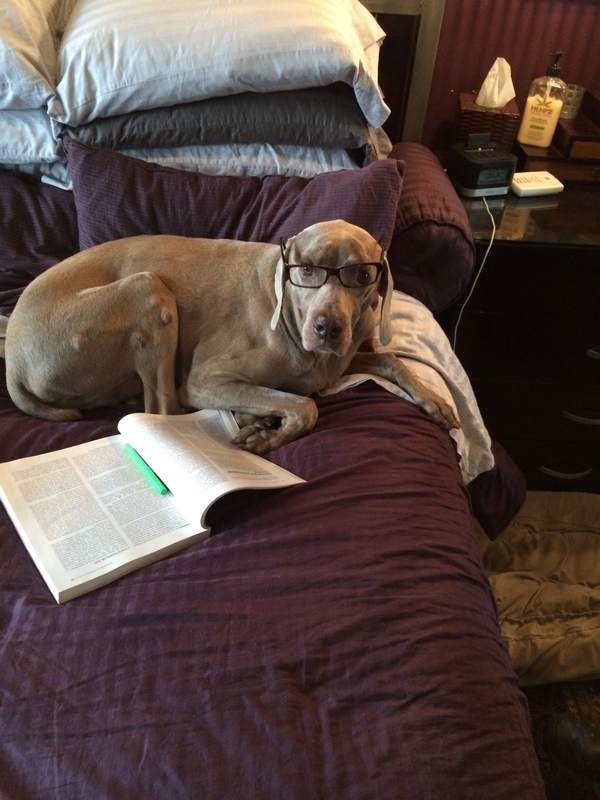 He will be 12 this year..
Our Clyde proves once again how smart he is–as are all Weimaraners. I came back to my room and he had promptly taken my place at the book. Here’s is another shot of the boys patiently waiting for me to come in from the deck; and one of them living it up on the deck. They have settled in quite nicely. We are all a bit anxious about how Luke ultimately will do when he is solo some day. I guess he will adapt. Either that or time for a long hair…. 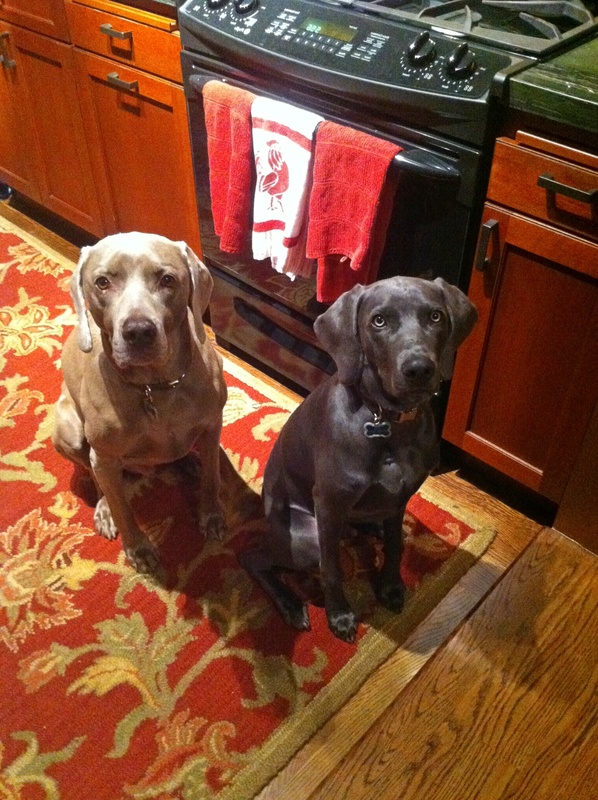 Breeder’s Note: We appreciate folks like you that take such good care of their Weimar family members. No one can say what will happen. We all want the ultimate. The one thing we can agree upon is that each day is a wonderful gift. The boys are doing well, Clyde is doing remarkably well at a spry 11 years next month. I recently learned of a 16 year old Male Weim that is holding his own. The boys grouch at one another when it comes chow time and gulp their food so we introduced new bowls which distribute their kibble around three protrusion (pegs if you will) that come up from the bottom of the food bowl. This makes for a 12 minute meal versus the previous 4 minute inhaling of their food. Breeder’s Note: There are various types of dishes designed to stop your dog from gulping their food. We feel it is important to teach them to eat slower. 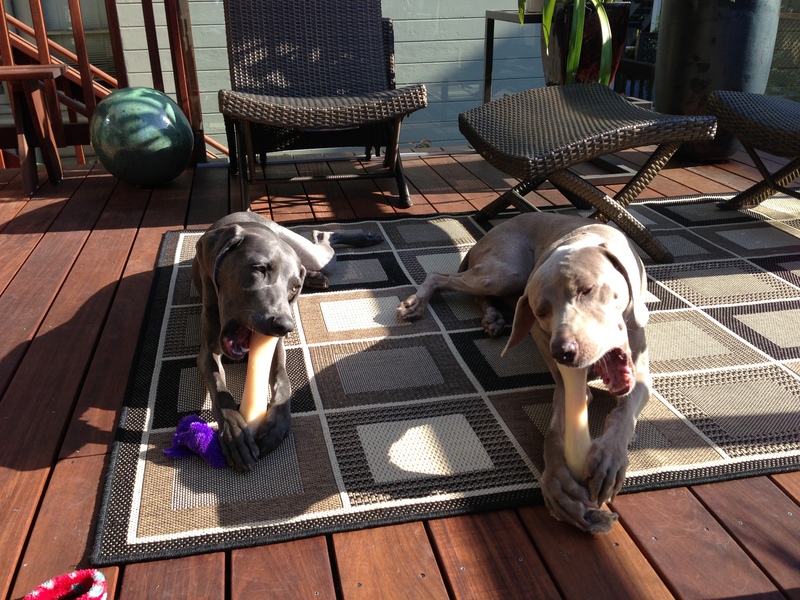 Some Weims are nibblers, but others gulp their food. There is evidence that gulping food and water, can lead to bloat. Regardless, eating slow is better for the digestive system. 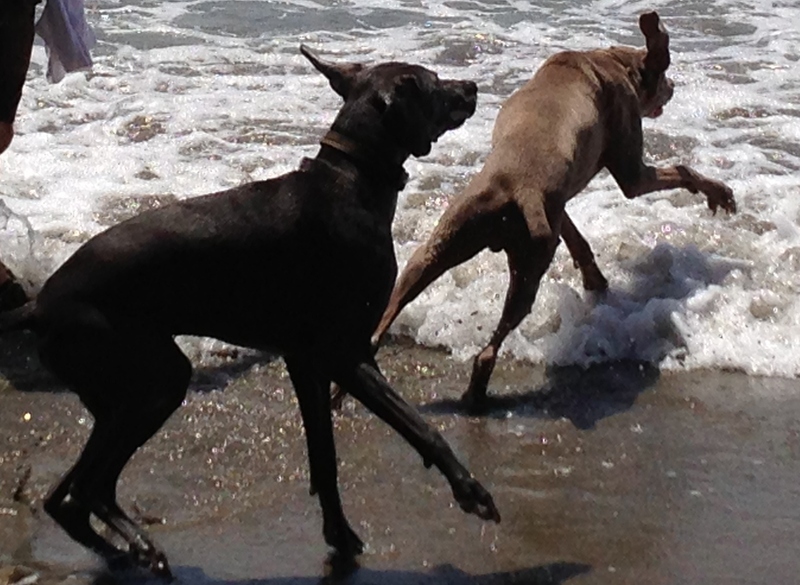 We know the Weimaraner that lives past the norm does so for many reasons. There are many dangers, and potential risk lurking about. Health issues can arise (as they do for humans). Good nutrition, age-appropriate exercise, and a healthy diet go a long way toward promoting health. No one can guarantee longevity, but beating the odds is more likely with the best of care. 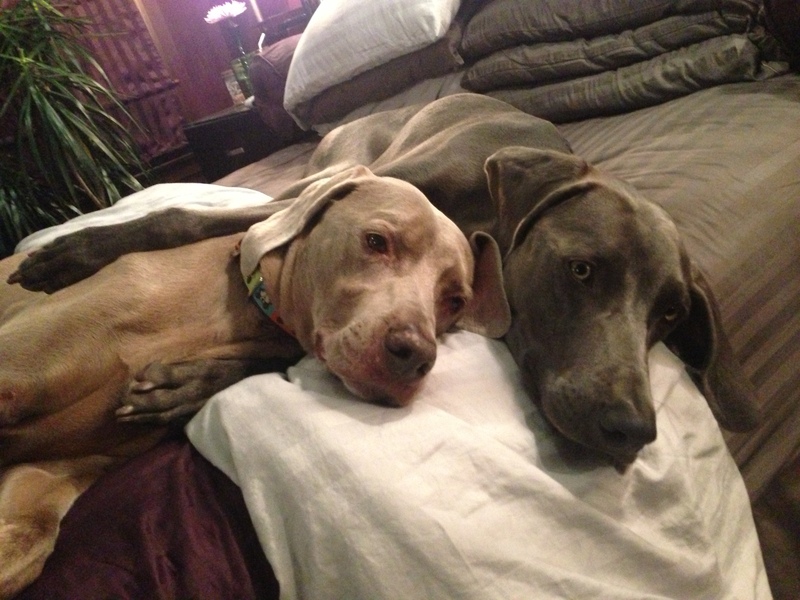 Thank you Cal for providing the best for these two wonderful Weimaraners. 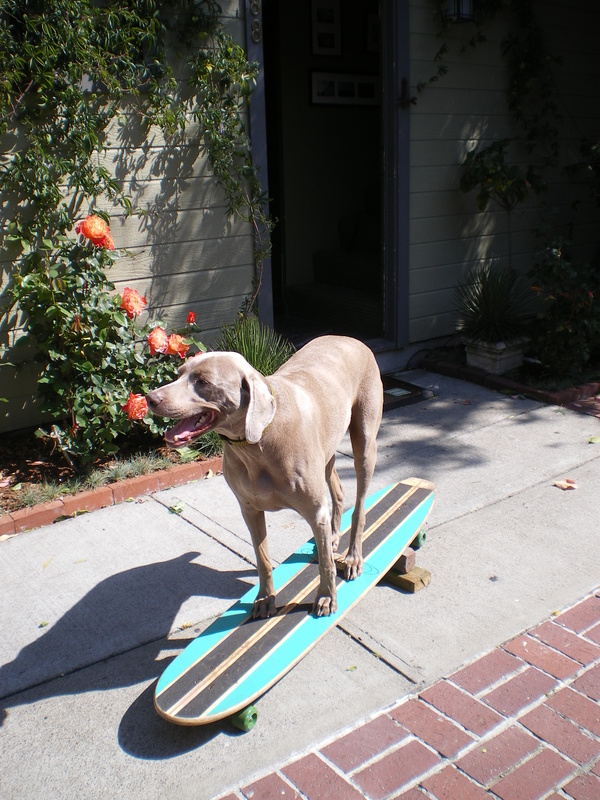 Cal, is a longtime OwyheeStar fan, client, and extreme Weimlover. 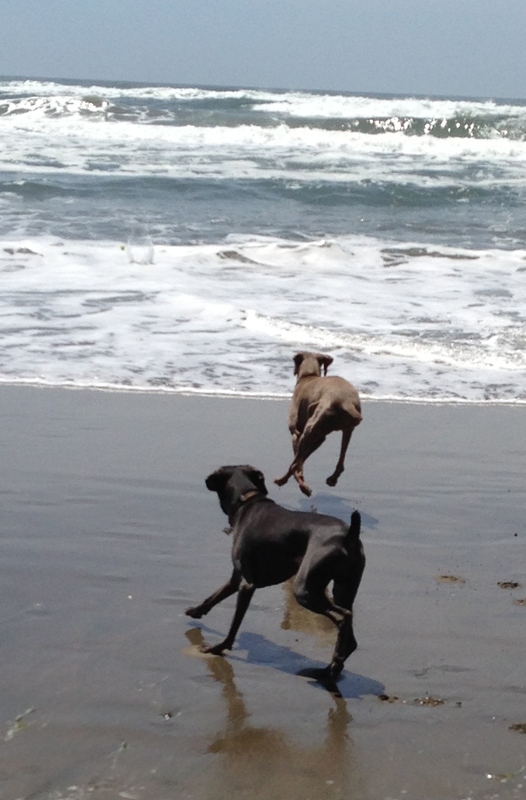 He lives in San Francisco with Clyde and Luke–two OwyheeStar Weims. He gives his two fur family members the best of everything. 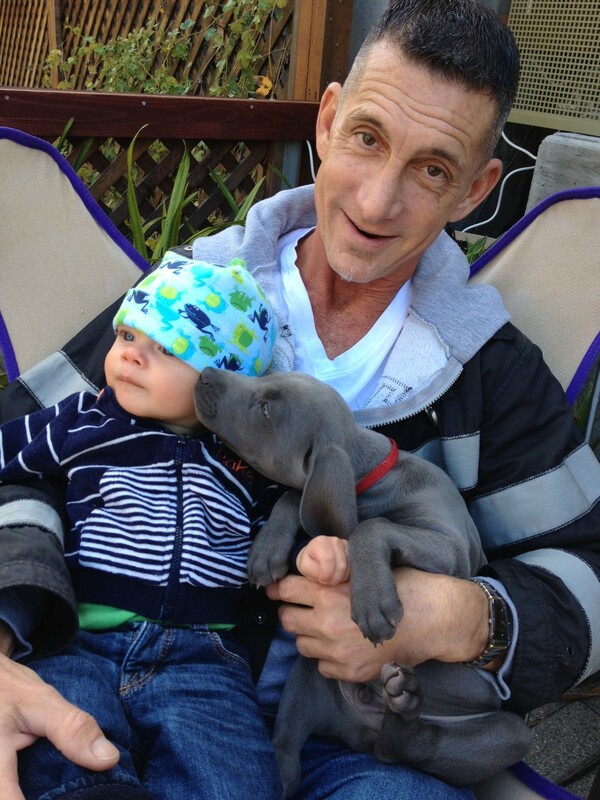 Adding a 2nd Weimaraner to the family takes a knack. I just wanted to let you know that Luke is doing great. He is a bit on the smaller side at 9 months now but he has engaged Clyde like no one’s business and they get along great. He loves his crate which he still sleeps in due to some infrequent pee accident by overall we give your choice a 10. Breeder’s Note: Clyde is probably what we would consider an old-man, but he has adapted and adjusted making room for the new blue OwyheeStar — Luke. Not so long ago, they looked like this photo below. There were challenges, but patience has proven even an old dog can learn to accept a new fur-family member. Thank you Cal for the great update, and for staying in touch with us for so many years! Clyde a good-looking senior Weimaraner poses for photo! Or Clyde has a brother named Luke! 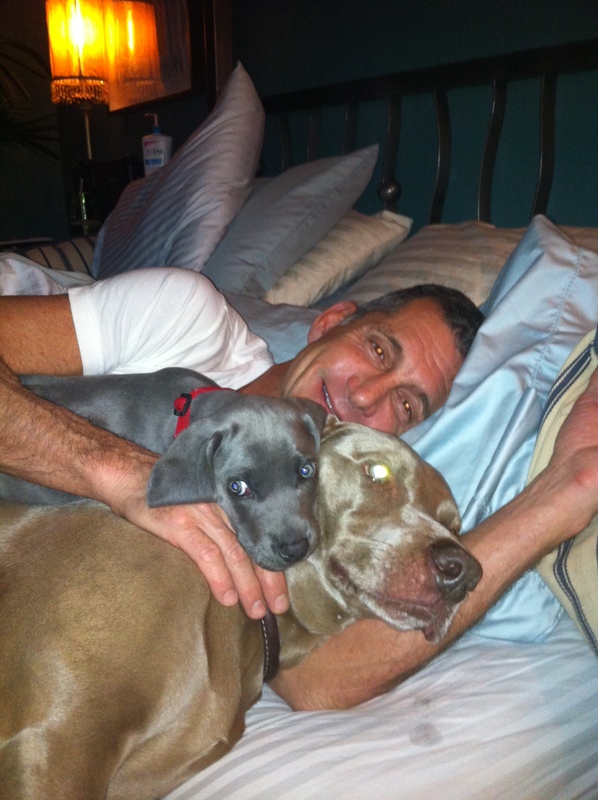 ~ Bringing home a second Weimaraner can pose all kinds of questions. Is it the right time? Can I handle the situation? Will my faithful companion, adjust to the idea? What can I do to help this happen? The most important two things you can do: 1. Introduce them in the right manner. 2. Keep the focus on your resident, not the new cute puppy! Once the resident Weim discovers they are still the center of your universe, things will go more smoothly, and they will readily accept the new interloper. We are happy to report no accidents inside! Luke hits the mark every time . He has mastered the stairs and definitely knows where the front door is. The water and of course the food bowl. He cries from the kennel when he needs to go and doesn’t fuss all that long when we return him to his crate to sleep. Our prior dog walker has agreed to do the daily potty and door runs, we are thrilled about that. If they can handle the addition onto their route than they will be walking both boys after Luke is 4 months. 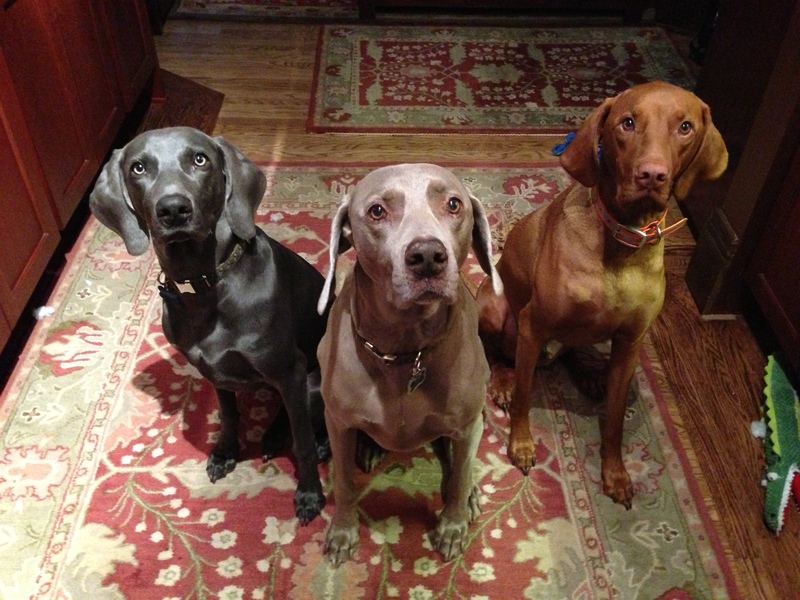 We will be baby sitting Baker along with their Vizsla Szabo. Clyde is adjusting to our newest family member! Clyde has finally given into the idea that our lovin is more important than his acting like a tough guy. Thanks again, we’re going to do just fine! We ordered our NuVet supplements and the Fastrack powder. Luke has had his first bath today. He had his ears cleaned. We took the electric toothbrush and the toenail dremel for a test run. This was all just to expose him to his future spa treatments. He is going to be spoiled silly just like Clyde!